Ryanair: you either love them or you hate them. Well actually I love them and I hate them! I love them because I can fly Birmingham to Dublin return for under £60 including all the ludicrous hidden charges. I hate them because of the tiny seats and the constant sales patter for lottery tickets and smoke-free cigarettes. However the flying time is little more than 40 minutes so it’s not long to put up with the nonsense. I’d not been to the Curragh this century. My last three visits were all in the 90s: the Guineas’ weekends in ’94, ’96 and ’99. In fact the ’96 weekend was the subject of my first ever report for the LRC magazine. Following the successful Punchestown “Thoroughbred Trail Weekend” last November (see my earlier report); I decided to book the same package for the Irish Oaks weekend. For the Punchestown event I had chosen the Keadeen Hotel in Newbridge. It proved to be a great hotel and as it is less than two miles from the Curragh it was the obvious choice for this weekend. It turned out my reservation had been cancelled. Fair play though as I was immediately upgraded to a luxury room because of the hotel error. Indeed things got even better. At dinner, having been served my starter, the waitress informs me my drinks for the evening are on the house! Great start to the weekend. 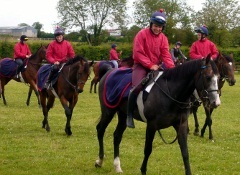 Saturday morning we were off bright and early to Michael Halford’s yard. What an impressive set up it is too! I’ve not been to that many stables over the years but this was definitely the best. What’s more it was populated with very high quality horses. Everywhere you looked there were horses owned by the likes of Sheikh Mohammed or the Aga Khan, the latter in particular being well represented. Next it was off to the Curragh. In November there were 120 people on this package spread across three or four hotels. This weekend there was a total of six. Something must have gone wrong with the marketing! I would not let that put you off as you obviously get more attention with fewer people participating. We had a nice table in the Horseshoe restaurant overlooking the track and our host Frances Crowley had arranged for Kevin O’Ryan, the well known ATR pundit and jockeys’ agent, to talk us through the card. As for the food, this was very good apart from my gamble to select the fish main course (something called blossom), which proved rather tasteless. On with the punting. No bet in the opening maiden then two losers in the next, which finished second and fourth. The third race was a 15-runner 7f handicap and I played some draw inspired bets to no avail. 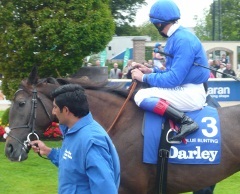 The fourth race was the Group three Minstrel Stakes for which The Cheka was all the rage and heavily supported to odds on. I thought this was worth taking on as it touched 8/11 at one stage. I identified two on the tote both projecting several points more than their ring prices: Hujaylea and Across The Rhine. The latter did the business leading all the way and paying a 23.10 dividend despite returning an SP of 12/1. I was back in the game. The next race was another poor maiden but this was followed by a 17-runner handicap over 6f. I had not taken much notice of Kevin’s selections for the day but interestingly he had remarked how the high draw had been significantly favoured in 5f and 6f races at the Curragh this season. Being a fan of draw-inspired bets I had made a mental note of this. I picked out three highly drawn selections at tote odds and this included Lake George – drawn 17 – which came through to take it up close to the stand rails. SP 16/1, tote 24.10 dividend. The closing Nursery handicap was no good to me but the day had finished with decent profits owing to the two 20/1+ winners on the tote. The next morning, after taking in the excellent leisure centre at the hotel, I decided to walk to the track. This turned out to be quite invigorating. Although it was dry a near gale force wind was blowing across the Curragh. Saturday’s admission charge was included in the package of course whereas on Sunday we were on our own. 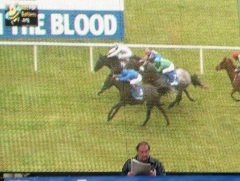 I thought the entrance fee of 20 euro was reasonable given the quality and the quantity of Sunday’s racing. It was the big race day featuring the Irish Oaks. During the week I had tried to find some ante-post value but had failed to do so. The eight race card looked rather daunting so I decided to restrict my wagering to five races, eliminating the first two races (small fields) and the classic. Next it was the big one and I spent some time taking pictures of the preliminaries. Two of the principal contenders in the Oaks are shown below. The race itself was spectacular not least because of Frankie’s perfect timing. Unfortunately I failed to capture his flying dismount owing to my poor photography skills! Next it was the Ladies’ Derby, a very competitive handicap with (mostly) very inexperienced riders. I couldn’t decide what to back so I picked out four rags whose odds were inflated on the tote and just placed a tiny bet of four euro on each. Amazingly Paramount, a 20/1 chance, which came with a storming late run, was one of these. Even more amazing was the winning tote return: 55.70! How often does a 20/1 shot pay 50/1 or more on the UK tote? Hardly ever. This proved to be the peak of my betting activity as the closing three races proved hopeless. Two of these were 5f handicaps in which I unsuccessfully tried to exploit the high draw factor. Nonetheless despite backing nearly 30 horses in total, it proved to be two profitable days’ racing with winners at 23.10, 24.10, 9.70 and 55.70. If you happen to read this before 9 September I would urge you to consider going on the final “Thoroughbreds” trip of 2011 to the Irish St Leger, which includes stable visits to both Dessie Hughes and John Oxx. If not keep an eye out for next year’s dates.